CMF represents 0.4%-0.5% of all the primary bone tumors. The most common site of origin is the lower extremity around the lower end of femur and upper end of tibia. Involvement of the skull bones is extremely rare. Till date, only nine such cases including this patient, involving the temporal bone have been reported in the literature. We report one such case elaborating the clinical presentation, radiological features, and histopathological findings. 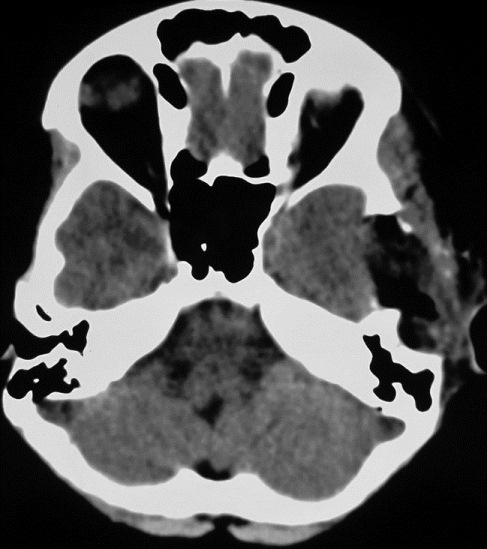 A 12-year-old, right-handed, female patient was admitted with complaints of gradual-onset headache of 1 month duration. Initially, her headache was generalized, but later on, it was localized in left temporal region. It was mild to moderate in intensity, not associated with vomiting and no other aggravating and relieving factors. It was associated with pain in the left ear of 1 month duration, the pain was continuous, dull-aching in nature, and not associated with fever, ear discharge, or diminished hearing in the left ear. The patient also gave a history of painful swelling over the left preauricular region of 15 days' duration. Swelling was initially about the size of a lemon which had gradually increased over a period of 15 days to the present size of an apple. There was no redness or discharge from the swelling. There was no history of trauma at the site of swelling. There was no difficulty in chewing from left side of the jaw. On examination, higher mental functions were normal. Cranial nerve examination was normal. Power was 5/5 in both the lower limbs. The sensations were intact. Reflexes were normal in both lower limbs and plantars were down-going bilaterally. On local examination, there was a 4 cm × 3 cm-sized swelling over the left temporal and zygoma in the left preauricular region. The swelling was hard, lobular, and tender on palpation. The swelling was non-pulsatile and there were no scars, sinuses, or dilated veins over the swelling. There was no difficulty in chewing or jaw movements on the left side. 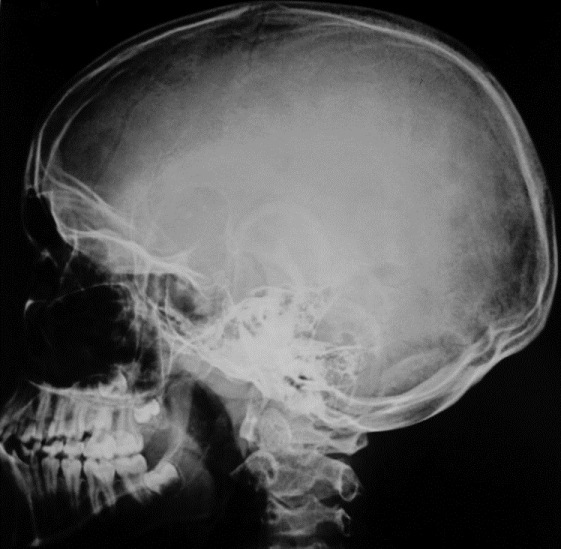 X-ray of the skull [Figure 1] was suggestive of a multilobulated radiolucent lesion with well-defined margins in the left temporal region. Computerized tomography (CT) scan [Figure 2] revealed an expansile mass about 4.1 cm × 3.2 cm in size, arising from the left temporal region in the floor of the middle cranial fossa. It showed isodense, soft tissue within and also showed small calcific foci suggestive of chondroid neoplasm. Magnetic resonance imaging (MRI) scan [Figure 3] showed 4 cm × 3.7 cm × 4.4 cm-sized lobulated expansile mass in the squamous part of left temporal bone. Cortex was well maintained with no intracranial extension. The lesion was hypointense on T1-weighted images, isointense on T2 FLAIR, and heterogeneously hyperintense on T2-weighted images with strong heterogeneous post-contrast enhancement with non-enhancing areas within. The patient was operated by left temporal curvilinear incision with complete excision of the lesion along with a 5 mm-margin of surrounding normal bone. The tumor was well circumscribed along with thinning of the adjacent temporal and zygomatic bone. The tumor was firm in consistency and grayish white in color. On histopathological examination [Figure 4], tumor cells could be seen arranged in a lobular pattern. Individual lobules show central hypocellular and peripheral hypercellular areas comprised of sheets of chondrocytes and stellate cells interspersed within a chondromyxoid background. There was no evidence of mitosis. The periphery of the lesion showed capillary proliferation with numerous, dilated, cystic spaces. 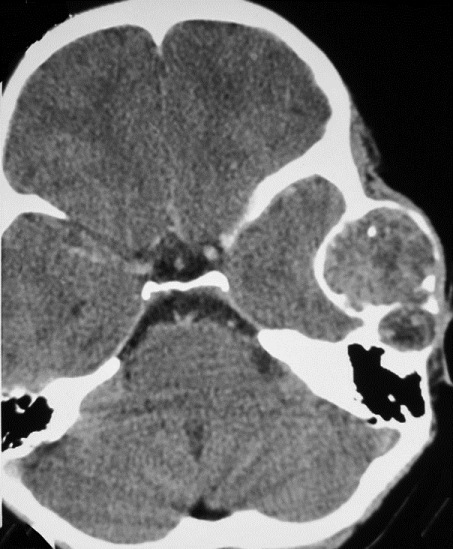 Focal areas of dense calcification were also seen suggestive, of CMF. Post-operatively, the patient was relieved from her headache, left-ear pain, and swelling with no new neurological deficit. Post-operative CT scan [Figure 5] showed complete excision of the tumor. There has been no recurrence till the recent follow-up. CMF is a rare, slow-growing, benign tumor of cartilaginous origin and was first described by Jaffe and Lichtenstein in 1948. It represents 0.4%-0.5% of all primary bone tumors. The most common site of involvement is the metaphysis of the long bones, especially around the knee joint, with the involvement of the skull bones being extremely rare. In the skull, CMF develops from the cartilage or embryonic rests of cartilaginous tissue, which can be entrapped at the sites of sutures or skull base during the process of endochondral ossification. The most common age groups affected are those in the second and third decades of life, with a predilection for males. , Our patient falls in the common age group, but differs as far as gender is concerned. MRI images show a hypointense lesion on T1-weighted, hyperintense on T2-weighted images with intense contrast enhancement. ,, In the present case, most of the characteristic features were present on imaging. The rate of recurrences varies between 3% and 26% with an interval of 5 months to 10 years. , Our case did not have any recurrence till the recent follow-up of 6 months. CMF is a benign, slow-growing cartilaginous tumor. Involvement of the temporal bone of the skull is extremely rare. Differential diagnosis should be kept in mind, especially in cases of calcified lesions and includes chordoma, chondroid chondroma, and low-grade myxoid chondrosarcoma. En-bloc complete resection should be the aim to achieve cure. Post-operative radiotherapy may be required for incomplete resections. We thank the Dean, Sir J.J group of hospitals for allowing us to publish the hospital record. 1. Jaffe HL, Lichtenstein L. Chondromyxoid fibroma of bone; a distinctive benign tumor likely to be mistaken especially for chondrosarcoma. Arch Pathol (Chic) 1948;45:541-51. 2. Tarhan NC, Yologlu Z, Tutar NU, Coskun M, Agildere AM, Arikan U. Chondromyxoid fibroma of the temporal bone: CT and MRI findings. Eur Radiol 2000;10:1678-80. 3. Wu CT, Inwards CY, O'Laughlin S, Rock MG, Beabout JW, Unni KK. 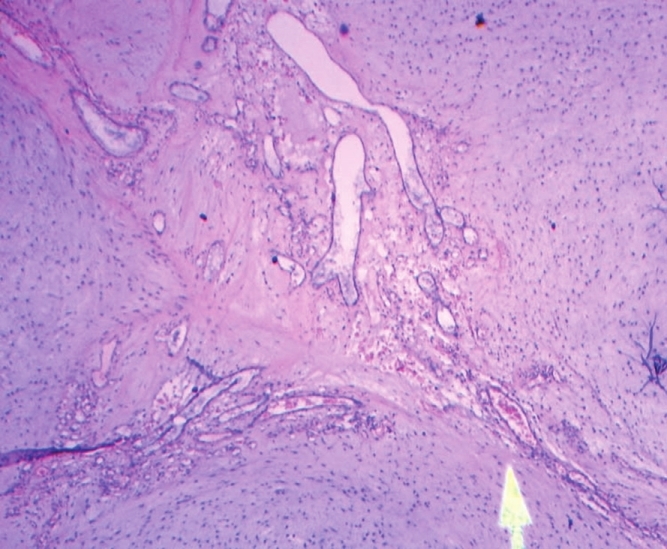 Chondromyxoid fibroma of bone: A clinicopathologic review of 278 cases. Hum Pathol 1998;29:438-46. 4. Haberal AN, Bulezuk B, Coskun M, Altinors N, Demirhan B. Unusual presentation of a chondromyxoid fibroma of the temporal bone. Turk J Med Sci 2001;31:91-3. 5. Unni KK. Chondromyxoid fibroma. Dahlin's Bone Tumors General Aspects and Data on 11087 Cases. 5 th ed. Philadelphia: Lippincott-Raven; 1996. p. 59-69. 6. Hakan T, Vardar Aker F. Chondromyxoid fibroma of frontal bone: A case report and review of the literature. Turk Neurosurg 2008;18:249-53. 7. Desai SS, Jambhekar NA, Samanthray S, Merchant NH, Puri A, Agarwal M. Chondromyxoid fibromas: A study of 10 cases. J Surg Oncol 2005;89:28-31. 8. Feuvret L, Noël G, Calugaru V, Terrier P, Habrand JL. 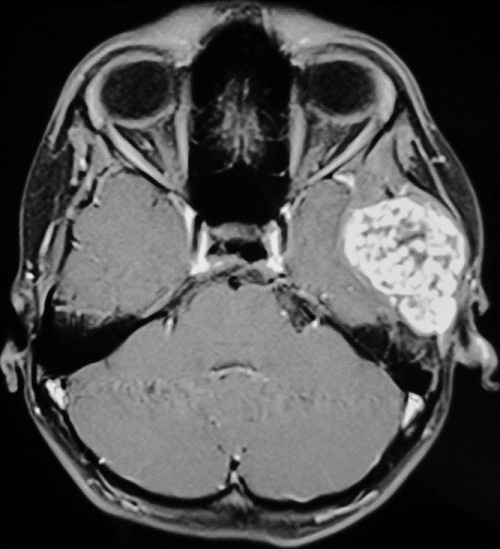 Chondromyxoid fibroma of the skull base: Differential diagnosis and radiotherapy: Two case reports and a review of the literature. Acta Oncol 2005;44:545-53. 9. Morimura T, Nakano A, Matsumoto T, Tani E. Chondromyxoid fibroma of the frontal bone. AJNR Am J Neuroradiol 1992;13:1261-4. 10. Bleiweiss IJ, Klein MJ. Chondromyxoid fibroma: Report of six cases with immunohistochemical studies. Mod Pathol 1990;3:664-6. 11. Keel SB, Bhan AK, Liebsch NJ, Rosenberg AE. Chondromyxoid fibroma of the skull base: A tumor which may be confused with chordoma and chondrosarcoma. A report of three cases and review of the literature. Am J Surg Pathol 1997;21:577-82. 12. Karkuzhali P, Chithralekha S, Muthuvel E, Daniel RB. Chondromyxoid fibroma of the parietal bone. Neuropathology 2005;25:84-8. 13. Mohan H, Mittal P, Mundi I, Kumar S. Fibrous dysplasia of bone: A clinicopathologic review. Pathol Lab Med Int 2011;3:31-42.